Analog Artist Digital World: Cutting the Turkey. Thanksgiving in Iowa was a crash course in Midwestern hospitality. The family farm occupies 16 acres but is land-locked on three sides by neighbors' farms. The red house is at the top of a hill which allows epic views of sunsets and sunrises. It is the end of bow hunting season, but that didn’t stop a lone doe from standing at the edge of the woods about 100 yards away from the back sliding glass doors. Up in another clearing about a quarter mile away wild turkeys foraged at the edge of the field. 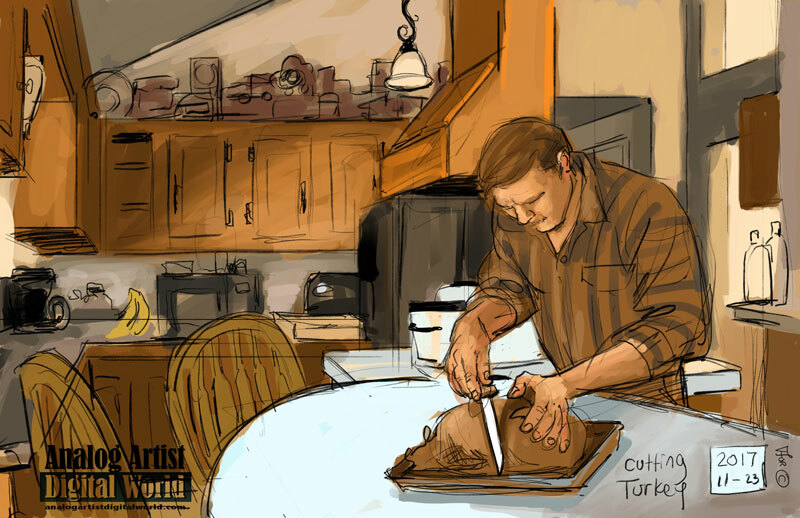 Ron Schwartz was responsible for carving the turkey and I couldn’t resist sketching the Norman Rockwell moment. First, all the stuffing was removed and then carving commenced. Ron is skilled with knives, so the carving went quickly. The kitchen behind him was alive with activity as the other Thanksgiving sides were prepared. Green beans had crunchies, potatoes had gravy and four different pies waited for desert. No one at a Schwartz dinner table leaves hungry. Once the Turkey rib cage was cut free of all the white meat, Ron put the bird and platter on the back porch where four outdoor cats picked it clean. The cats must have even swallowed some of the bones. Later, after we ate and were playing board games, the black cat hauled a huge dead squirrel up on to the porch and dropped it down by the sliding glass doors like some sort of reciprocal peace offering. The cats had celebrated Thanksgiving in grand style, and even enjoyed a squirrel for dessert.